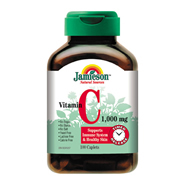 Jamieson timed release 1000mg formula is special time-diffused micro-encapsulation which allows for a gradual release of vitamins over 6 to 8 hours. Each caplet contains: Vitamin C (ascorbic acid) 1000mg. Prepared in a base of acerola, rosehips and Vitamin C complex factors, rutin, hesperidin and bioflavonoids.